It’s always wonderful going home to see my parents. I don’t have to cook for almost the duration of the visit and on top of that, the meat and produce in Australia is second to none, especially these days when you can find even the most exotic of items in the regular grocery stores. I arrived yesterday and immediately mom and I went to the grocery store to pick up some stuff to make for dinner. I noticed that duck, kangaroo were all on the shelves alongside the chicken, beef and lamb. Yes it was expensive, but it was readily available and one did not have to go to a specialty grocery store to pick those things up. My family moved to Australia 23 years ago and back then the variety of food was still quite limited to the Anglo-Saxon variety. There were middle eastern restaurants and of course Indian, Chinese and of course, Vietnamese restaurants, but trying to buy ingredients at your Coles or Woolworths (similar to Safeway and Albertson’s) was pretty much standard fare. These days, the abundance of Asian vegetables and spices sit comfortably alongside the lettuce and parsley. Last night, my dad made steaks for dinner, while mom put together a simple salad. 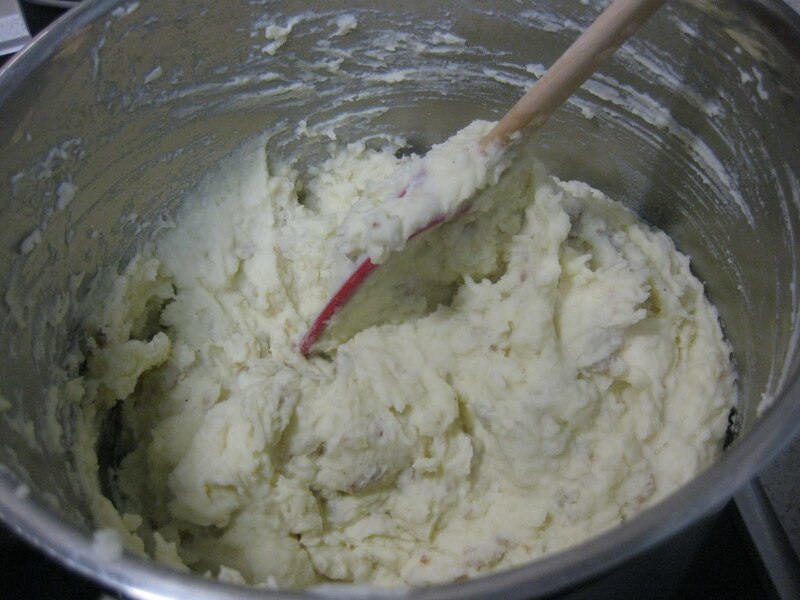 I made garlic mashed potatoes. I love steaks here! The meat is grass-fed and has full beefy, meaty flavor. This is the only time I am able to eat my meat medium-rare to rare — when the quality of meat is so outstanding that I am able to eat a 14oz slab on my own. At first I told my parents I will share a piece with someone — it looked HUGE! — but after I got through the first quarter, I changed my mind and said I think I can finish it after all. Even my 10-year old polished off an entire steak on his own which was quite amazing a feat! I can’t wait for my 2-weeks filled with awesome food, especially the home cooked ones my mom makes! Once I leave, I will have to wait another year before someone cooks for me again. >Have fun down there. It sounds like a great experience! >Anthony — it's always great for me to see family, relatives and friends. I shall be posting some more food adventures in the next few days! Thanks for reading!